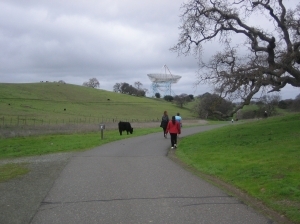 One of the most popular walks and runs on the entire Peninsula is known as The Dish, named after the large old radiotelescope used for research in the Stanford foothills and visible from throughout the area. Rain or shine, you'll find hundreds of locals and Stanford students walking or jogging the trail. The paved trail climbs the hills and offers spectacular views of the Peninsula, the campus and the coastal mountains. On a clear day visitors can see San Francisco, Oakland, San Jose and the East Bay. The main loop trail is 3.5 miles and takes about an hour and fifteen minutes to walk. There are three gated entrances. Most visitors use the Stanford Ave. gate, located where Stanford Ave. intersects with Junipero Serra Blvd. Parking is allowed on Stanford Ave., but be sure not to park on the side streets where Stanford residential parking permits are required or you'll be ticketed. The Gerona gate is near Campus Dr. and Lake Lagunita, but there is no parking. The Alpine gate is near Interstate 280 on Alpine Rd. at Piers Lane. The trail from the Alpine gate intersects with the main loop trail near the big dish and adds about a mile and a half to the full loop. The Dish area is open from sunrise to sunset (from 6 or 6:30 a.m. to 5:30 to 8 p.m. depending on the season.) No dogs or bicycles are allowed. Stanford security staffs a small gatehouse at the Stanford Ave. main gate and patrols the trails. Visitors must stay on the paved trail, so no map is necessary.